Collège Dupanloup (Boulogne-Billancourt | France) is conducting an unexpected initiative. A group of young pupils will fly to Madagascar during summer vacations. They will teach Math or French lessons as well as giving theatrical representations. Irene Petit, their french teacher is on the front line to make this dream come true. An organisation has been set up (Tous en Scène pour Mada, literally meaning Everyone on stage for Mada) together with a website and numerous actions to get funds. The ChessSolidarity program administrated by ENJE (which publishes ECHECSINFOS) chose this NGO for a new gift in the form of chess game sets, Reti method for teaching, flyers with chess rules, medals. 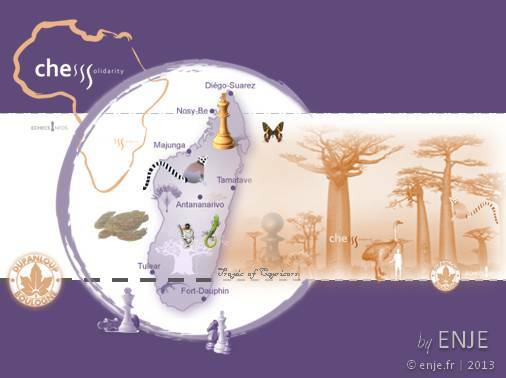 This time we offer a 5 months training session so that the children going to Madagascar could also teach chess.